The Bootable Rescue Media screen shows the components of Active@ Disk Image used to start an unbootable system to restore a disk image. 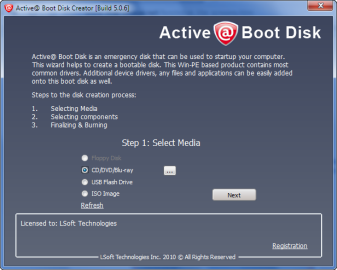 Active@ Boot Disk Creator component allows to create a USB Flash, DVD/CD bootable disk. 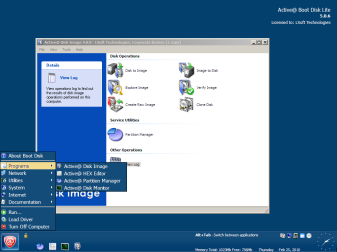 Boot Disk Creator allows to customize a boot disk by selecting Boot Disk Edition, adding user's files and third-party drivers to the disk or ISO image.You may also add startup scripts allowing further customization of Boot Disk environment and select other options like additional language support or time zone.The meter in the bottom of the screen shows space allocation details.